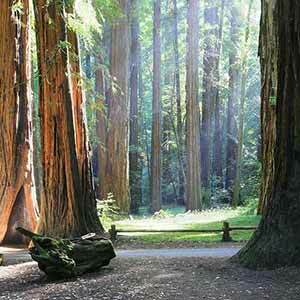 Armstrong Redwoods features a small but attractive old-growth redwood grove. 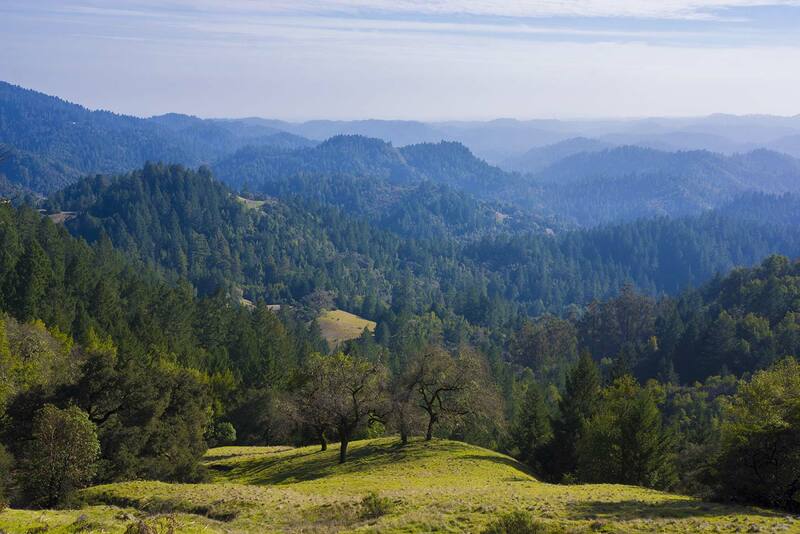 The park is in a canyon just north of the Russian River and the town of Guerneville. The Russian River is a popular summer resort area. The ultra-liberal town of Guerneville is the biggest in the area and is ideally located between the dreary fog and frigid sea breezes of the coast and the baking heat of the inland valleys. Surrounded by hills covered with second-growth redwoods, the river has several beaches good for swimming. Canoes can be rented and are a common sight on the river, while River Road offers a flat and scenic bicycling route. 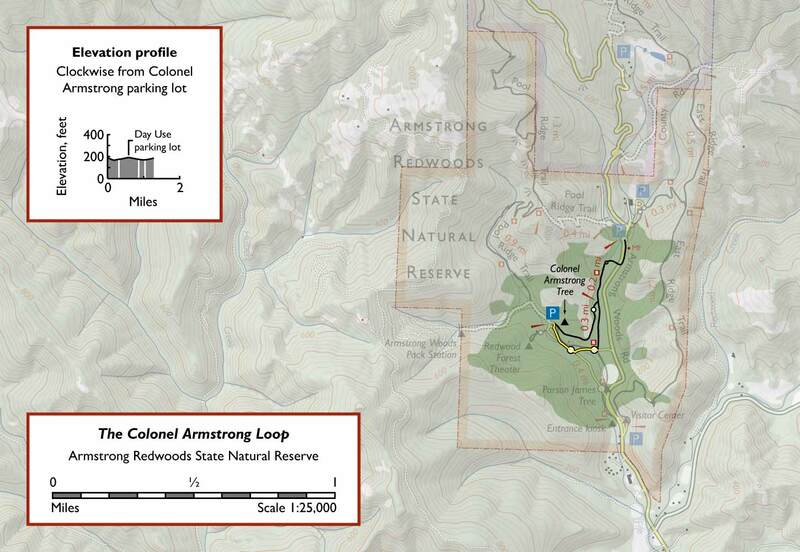 Armstrong Redwoods’ visitor center and main parking lot are actually located outside the entrance gate. Most visitors park here and walk an extra 10 minutes to save the $10 entrance fee. Inside the gate, the road splits: the right-hand road goes to a picnic area with lots of parking; to the left, a one-lane road with two-way traffic leads to the Armstrong Tree, where there are a few shady parking spots in a particularly serene and attractive part of the grove. Most people instinctively go right and so spots are often available by the Armstrong Tree even on summer weekends. 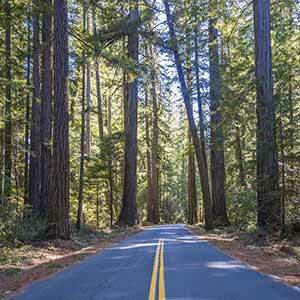 The best scenery and largest redwoods in the park are actually along the single-lane road; the trails are less impressive. The park is quite popular, in part because it’s one of the closest redwood groves to San Francisco and in part because of the popularity of the Russian River area. With its relatively small trees and dense understory of tanoak, Armstrong Redwoods more resembles southern groves like Muir Woods or Big Basin than the lusher, more open stands to the north. 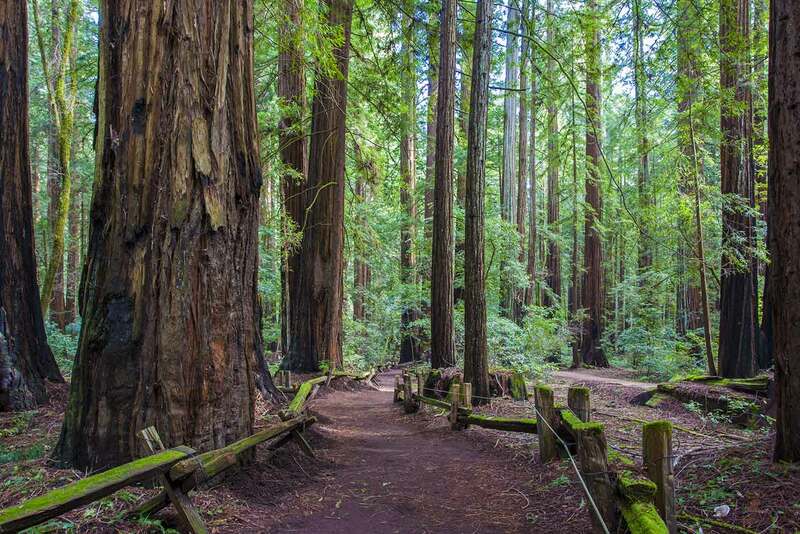 Yet it’s more impressive than other southern groves, with a higher density of good-sized trees and a moderately dense carpet of sorrel and ferns; the deep shade and the way sounds echo off the trunks create some of the otherworldly atmosphere of the North Coast redwoods. 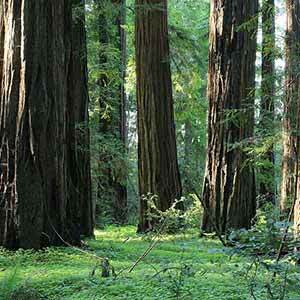 The main drawback to Armstrong’s redwood grove is that it isn’t very big. In fact the short Discovery/Pioneer loop described here passes through most of the park’s old growth grove. Just south of the loop, on the way to the entrance kiosk, the Pioneer Trail leaves the old growth and passes through a heavily-logged area, although near the gate there’s a collection of large trees. Just north of the loop, the Pool Ridge and Pioneer trails pass through short stretches of pretty nice old growth before entering more mundane tanoak woods. The reserve also offers two well-worn trails that climb the ridges on either side of the central canyon. These trails make a good workout but for the first few miles they aren’t especially interesting. As they climb out of the canyon, the redwoods disappear and are replaced with a tanoak and laurel forest; in addition the woods quickly become surprisingly dry, with no groundcover. 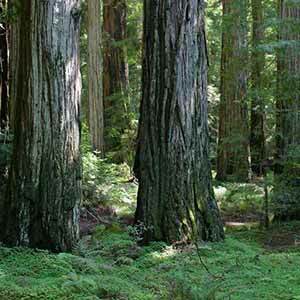 Since the reserve is located well inland, it may not get as much moisture from summer fog as other redwood parks. To the north, both ridge trails climb steeply into Austin Creek State Recreation Area, eventually reaching a very scenic ridge with superb views over the surrounding mountains. Horse rides are offered within the park and horse manure is common on the ridge trails, especially in summer. Here’s the park entrance in Google Maps and Google Street View. 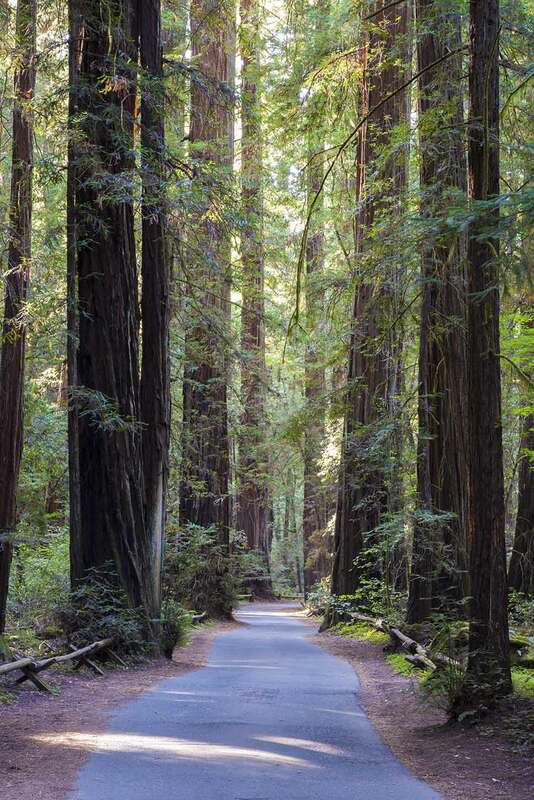 This flat 1.3-mile loop takes in the best of Armstrong Woods’ redwoods. It’s most enjoyable to start from the small parking lot near the Colonel Armstrong Tree (to reach this lot, stay to the left after passing the entrance kiosk), but if that lot is full you can also start from the larger day use lot. Take the Discovery Trail toward the Colonel Armstrong Tree and stay to the left at the first intersection. 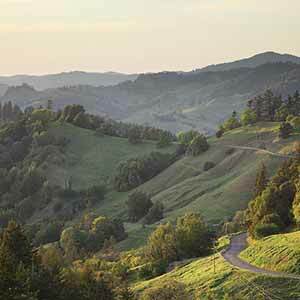 The trail runs past mid-sized redwoods with dense foliage as it curves around a hill. As it approaches the Pioneer Trail, it divides around the Icicle Tree and crosses Fife Creek on a bridge. Turn left at the intersection with the Pioneer Trail. 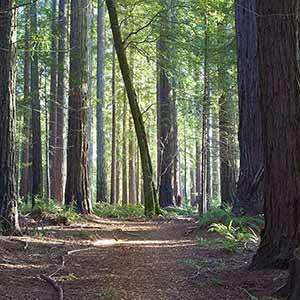 The Pioneer Trail runs through attractive redwoods close to Armstrong Woods Road. There are a few large trees on your way to the Day Use parking lot. When you reach the lot, turn around and return to the intersection, then continue straight until the trail crosses a small road. Turn right onto the road and cross an auto bridge. The Discovery Trail, which starts on your right just after the bridge, leads back to the Colonel Armstrong Tree. 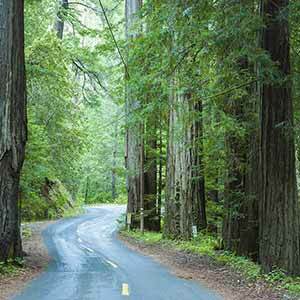 However, the road, although it’s just a few feet from the trail, is a lot more scenic and passes the best redwoods in the park. 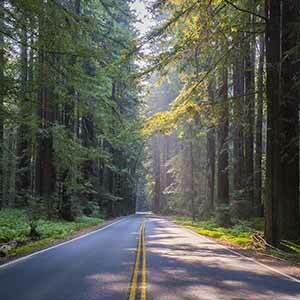 Traffic on the single-lane road is usually light and moves slowly, but step aside for drivers who may be paying more attention to the trees above than the road. BAHiker.com has a page that describes the East Ridge - Pioneer Trail loop. 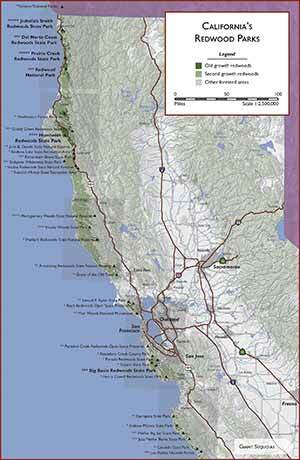 The official park page includes brief descriptions of some suggested walks.